Nobody likes paying the bills. That’s just the way it is. But when you invest in solar panel installation in Salinas, CA, there’s a decent chance that’ll turn right around for you, especially the first month your solar energy collection is so abundant that your utility bill is in the negative! At Salinas Solar Installation, we know that money is on our customer’s minds. Of course we all want to make a positive impact on the environment by pursuing cleaner forms of energy like solar, but many customers worry about the upfront financial investment, concerned about how long it will take for the transition to solar energy to pay off. Well, thanks to our many years of hands-on experience installing Salinas solar energy systems (and our many years navigating government subsidy programs and developing and maintaining customer-friendly financing options), our experts have all the answers to your financial questions. One of the allures of a residential and commercial solar panel installation is the significant utility bill savings that accompany the transition to solar energy. The extent of those energy bill savings are determined by several factors, and you can design your solar panel system to maximize those savings. Your home or business can accommodate a range of solar panels in a range of sizes, and (as you might guess) greater coverage leads to greater savings. The modular nature of solar panel installation allows you a flexibility like none other. For example, you may decide to start with just a few, smaller panels to get a taste for the benefits without going all-in. At any time, you’ll be able to add to the system, and with each panel, you’ll increase the solar capacity and reduce your energy bill even further, even into the negatives if you go big enough. 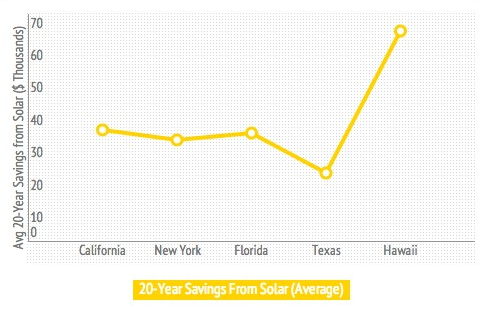 But you don’t even need to go big to reap the financial rewards of a top-quality Salinas solar energy system. Every panel reduces the amount of energy you draw from the grid, and that means one thing: savings. As fossil-fuels continue to deplete, non-renewable utilities will only continue to increase in cost. But the solution is at your finger-tips. Solar energy represents a new paradigm in energy collection and consumption, and with solar, you’re able to gain freedom from policies and procedures (and costs) of utilities providers. System size – namely, the number and model of solar panels you plan to install. Locale – how accessible the installation site is. Essentially, there’s an option available to everyone, because it’s possible to tweak each and every one of these factors to meet the individual needs of the home or business owner. So you may end up spending zero dollars on installation and use part of your savings to finance the system. Or maybe you’ll purchase a system outright for several thousand dollars, using that investment to generate thousands of dollars in revenue that outpaces the initial cost in no time at all. No matter what your current situation is, we guarantee there’s a Salinas solar panel installation that’s right for you and your budget. And our Salinas solar power experts are here to help you identify the right package. California represents the frontier of solar energy development, and this comes with a long list of government subsidies and Renewable Energy Incentives to reward those innovators that make the transition to solar. For those who qualify, their utility provider will end up paying for the energy created by the solar panels you’ve installed on your home or place of business, because the energy your panels have collected is then fed into the grid and they owe you for it. This is one way to achieve that coveted negative energy bill. There’s really no better feeling than when the electric company is writing the checks for you. At Salinas Solar Installation, we’ve seen it all, and we’ll help you determine exactly what incentives and financing you qualify for so that you’ll be able to enjoy the savings enabled by your top-quality Salinas solar energy system. So dial 831-263-1411 today to talk to solar power experts in Salinas, and learn how you can step into a future of clean-energy and massive financial savings.